For the American township, see Compromise Township, Champaign County, Illinois. For the 1925 American film, see Compromise (1925 film). For the 1931 American film, see Compromised (1931 film). To compromise is to make a deal between different parties where each party gives up part of their demand. In arguments, compromise is a concept of finding agreement through communication, through a mutual acceptance of terms—often involving variations from an original goal or desires. Extremism is often considered as antonym to compromise, which, depending on context, may be associated with concepts of balance and tolerance. In the negative connotation, compromise may be referred to as capitulation, referring to a "surrender" of objectives, principles, or material, in the process of negotiating an agreement. In human relationships, "compromise" is frequently said to be an agreement with which no party is happy because the parties involved often feel that they either gave away too much or that they received too little. Chamberlain (left) and Hitler, 1938. 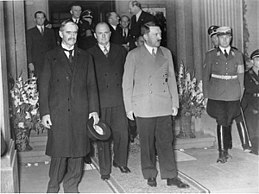 In international politics, the compromises most often discussed are usually regarded as nefarious deals with dictators, such as Neville Chamberlain's appeasement of Adolf Hitler. Margalit calls these "rotten compromises." In democratic politics, great challenges of contemporary democracy and has become more difficult in the era of the permanent campaign, as Gutmann and Thompson show. The problem of political compromise in general is an important subject in political ethics. The compromise solution of a multicriteria decision making or multi-criteria decision analysis problem that is the closest to the ideal could be determined by the VIKOR method, which provides a maximum utility of the majority, and a minimum individual regret of the opponent. ^ Global Knowledge (2008). "Methods of Dealing with Conflict - Part II". PM Hut. Retrieved 2010-01-11. ^ Thompson, Leigh; Hastie, Reid (October 1990). "Social perception in negotiation". Organizational Behavior and Human Decision Processes. 47 (1): 98–123. doi:10.1016/0749-5978(90)90048-e. Retrieved 5 September 2014. ^ Opricovic, Serafim. “A Compromise Solution in Water Resources Planning”. Water Resources Management, Vol. 23, No 8, 2009, pp. 1549-1561. Look up compromise in Wiktionary, the free dictionary. This page was last edited on 23 January 2019, at 20:29 (UTC).